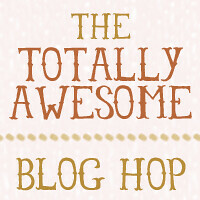 Hello, and welcome to the Totally Awesome Blog Hop. This will be an ongoing effort brought to you by four really cool ladies, hopefully resulting in the biggest community link-love fest evar! The hop will be linked between four sites, ensuring everyone's links get seen and clicked. We want our audiences to get to know each other! Our goal is community building between like-minded folks, and this is a place for of people to meet, make friends, and expand their following! #1 Follow your four hostesses- they are the first four links.